Calcium pyrophosphate crystal deposition is a spectrum of diseases, involving the musculoskeletal system. It may be asymptomatic or may manifest with pain, swelling, stiffness, and deformity of the joints. It may lead to secondary osteoarthritis of the joint. Awareness about these conditions is necessary to diagnose it and to differentiate it with other mimicking disorders. The diagnosis is often achieved by clinical manifestations, plain radiographs, and synovial fluid examination. The treatment is often symptomatic by conservative means, but in advanced arthritis, joint replacement may be needed. Calcium pyrophosphate (CPP) crystal deposition (CPPD) disease is a spectrum of clinical disorders characterized by acute inflammatory arthritis (pseudogout), chronic inflammatory, degenerative arthritis, and radiological calcification of cartilage which are also referred to as chondrocalcinosis. CPPD is estimated to have a prevalence of 4%–7% in the western population and its incidence increases with age. This disease usually occurs in the fifth decade of life, and in one study, the average age of diagnosis of CPPD was 72 years. It is more common in women than in men (1.4:1.0). The exact mechanism for the development of CPPD remains unknown, though overactivity of enzymes (pyrophosphohydrolase) that break down adenosine triphosphate results in deposition of organic phosphate in the joints and is caused by a multitude of factors including aging, genetic factors, or a combination of both. The majority of individuals with CPPD may remain asymptomatic, and there is considerable diversity in the patterns of joint disease among those who develop symptoms. Most joints in which CPPD is readily apparent on radiographs are asymptomatic. However, many patients having knee OA with a varus deformity may have pyrophosphates crystals without chondrocalcinosis on radiographs. Acute CPP crystal arthritis is characterized by a self-limiting acute or subacute attack of arthritis, involving only one or several extremity joints [Table 1]. The commonly used term of “pseudogout” signifies its close resemblance of the attacks of urate gout. The typical clinical manifestation includes symptoms and signs of severe acute inflammation (intense pain, redness, warmth, swelling, and joint disability) and in the occasional occurrence of synchronous inflammation of several adjacent joints (cluster attacks) or, conversely, petite attacks (which are minimally painful episodes of joint warmth and swelling. The knee is affected in over 50% of all acute attacks of acute CPP crystal arthritis, while the first metatarsophalangeal joint is the most frequently affected in urate gout. Other joints typically affected in acute CPP crystal arthritis include wrists, shoulders, ankles, feet, and elbows. Initial episodes of acute CPP crystal arthritis may persist longer before remitting than the 1 or 2 weeks commonly encountered in urate gout, and an upper extremity site of inflammation (wrist, elbow, and shoulder) for a first attack should raise suspicion for acute CPP crystal arthritis. These episodes are typically self-limited and usually last days to weeks. Rarely, after several acute arthritic flares, palpable and visible masses of CPP crystals, resembling gouty tophi, accumulate in synovium and adjacent joint structures and may lead to locally destructive and compressive symptoms. This presentation of CPPD disease resembles RA in several respects [Table 1], including the presence of significant morning stiffness, fatigue, synovial thickening, localized edema, and restricted joint motion due either to active inflammation or flexion contracture. Typically, the chronic inflammatory arthritis of CPPD disease involves multiple joints, frequently involving peripheral joints of the upper and lower extremities, as well as the knees and elbows, in a symmetric pattern. The joint inflammation may last up to several months. In the affected joint, the inflammation tends to wax and wane independently of each other. In comparison, the synchronous flare and remission are more typical, in RA. It is the most prevalent form of symptomatic CPPD disease. Approximately, 20% of cases undergoing total knee joint replacement for OA have shown CPP crystals in their synovial fluid samples. Moreover, about 50% of patients with symptomatic CPPD show progressive joint degeneration, usually involving multiple joints. This pattern of the disease has been referred to as “pseudo-OA” because of its resemblance to OA (occurring in the absence of CPPD). In about one-half of such patients, episodes of acute inflammatory arthritis typical of pseudogout punctuate its course. In the remainder, joint degeneration proceeds to classical OA [Figure 1]. The most commonly affected joints in this form of CPPD disease are the knees, followed by the wrists, small joints of the hand, hips, shoulders, elbows, and spine. Although the symmetric pattern of joint involvement is frequent, unilateral or more severe degenerative changes are also seen. Clinically, it does not typically differ from OA, where asymmetric bony enlargement, tenderness, effusions, crepitus, and restricted joint motion are present. The individuals with OA with CPPD may also exhibit contractures of involved joints and deformities of the knees [Table 1]. 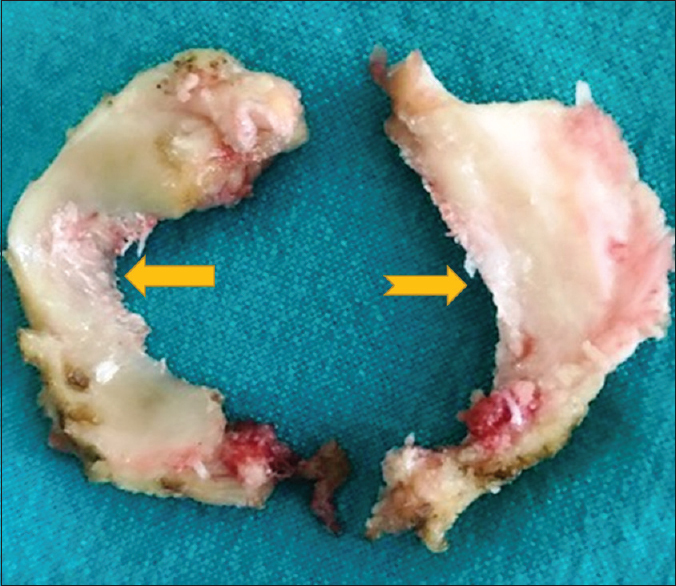 As the cartilage is damaged, during progressive joint degeneration, previously apparent cartilage calcification may become increasingly difficult or impossible to detect radiographically, thereby obscuring the diagnosis. The association of CPPD with severe joint degeneration has been reported, which closely resembles neuropathic or Charcot's arthropathy, where is joint denervation like in other medical conditions, namely diabetes mellitus (most common), tabes dorsalis, and syringomyelia. In contrast to neuropathic arthropathy, the neurologic function here is normal, prompting the use of the term “pseudo-neuropathic joint disease” for this condition. Although an underlying neurologic impairment (e.g., tabes dorsalis) in some instances has been demonstrated. The term “pseudo-neuropathic” is intended to convey the view that when CPPD is associated with neurologic deficits, the presence of crystals amplifies the destructive consequences of joint denervation. CPPD in the spine has also been reported, with clinical manifestations of stiffness and bony ankylosis, which can resemble the spinal changes of ankylosing spondylitis or diffuse idiopathic skeletal hyperostosis (DISH). Such features have been encountered in familial CPPD disease. Crystal deposition in the ligaments such as ligamentum flavum of the cervical spine level and posterior longitudinal ligament of the dorsolumbar spine may lead to acute spinal cord compression or may present as chronic spinal stenosis. CPPD occurring after trauma or prior surgery may result in localized inflammation or degeneration, most commonly in the knee or in the lower or lumbar spine. Furthermore, CPPD in bursae, ligaments, and tendons may also cause local nerve compression, as in the carpal tunnel. 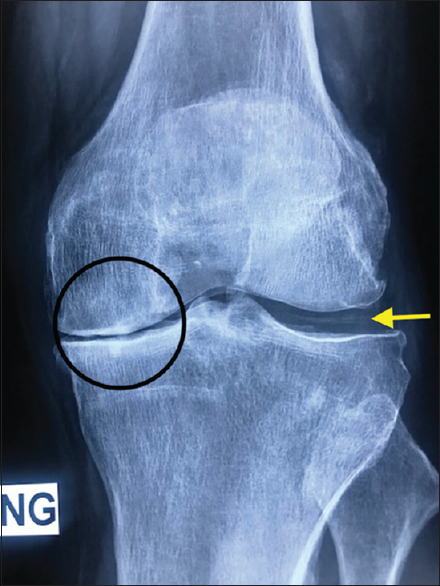 Radiographic evidence of CPPD is characterized by punctate and linear radiodensities seen in the articular cartilage (fibrocartilage and hyaline cartilage), also known as chondrocalcinosis [Figure 2]. Larger joints, such as the knee, wrist, elbow, shoulder, and hip, are most frequently involved in CPPD disease, but almost any diarthrodial joint may be affected. Articular capsule or synovial calcification is often fainter and more diffuse than cartilage calcification. The most salient finding on synovial fluid analysis in CPPD disease is the presence of positively birefringent CPP crystals by compensated polarized light microscopy. In inflamed joints during an attack of acute CPP crystal arthritis, phagocytosed crystals within polymorphonuclear leukocytes are often present. CPP crystals may also be present in the synovial tissue, although tissue sections stained with hematoxylin and eosin are less likely to demonstrate typical birefringent crystals, due to the dissolution of crystalline CPP in the acid reagents. The use of alizarin red staining has been reported to preserve the crystals and reduces the likelihood of a false-negative result, but false-positive or false-negative staining may occur. Macmullan P, McCarthy G. Treatment and management of pseudogout: Insights for the clinician. Ther Adv Musculoskelet Dis 2012;4:121-31. Wortmann RL, Becker MA, Schumacher HR, Ryan LM. Pseudogout: Presentation, natural history, and associated conditions. In: Crystal-Induced Arthropathies. New York: CRC Press; 2006. p. 111-28. Zhang W, Doherty M, Bardin T, Barskova V, Guerne PA, Jansen TL, et al. European league against rheumatism recommendations for calcium pyrophosphate deposition. Part I: Terminology and diagnosis. Ann Rheum Dis 2011;70:563-70. Ellman MH, Levin B. Chondrocalcinosis in elderly persons. Arthritis Rheum 1975;18:43-7. Masuda I, Ishikawa K. Clinical features of pseudogout attack. A survey of 50 cases. Clin Orthop Relat Res 1988;229:173-81. Derfus BA, Kurian JB, Butler JJ, Daft LJ, Carrera GF, Ryan LM, et al. The high prevalence of pathologic calcium crystals in pre-operative knees. J Rheumatol 2002;29:570-4. Nishikawa M, Takami K, Owaki H, Fuji T. Relationship between calcium pyrophosphate dihydrate crystal and operated knee osteoarthritis-gender specific analyses. Ann Rheum Dis 2018;77 Suppl 2:1634. Lomax A, Ferrero A, Cullen N, Goldberg A, Singh D. Destructive pseudo-neuroarthropathy associated with calcium pyrophosphate deposition. Foot Ankle Int 2015;36:383-90. Mori K, Imai S, Nishizawa K, Matsusue Y. Cervical myelopathy due to calcification of the posterior atlantoaxial membrane associated with generalized articular deposition of calcium pyrophosphate dihydrate: A case report and review of the literature. J Orthop Sci 2015;20:1136-41.